When designing PCB's there several software packages to choose from, these can range from free Open Source options all the way up to full fledged highly integrated software suits. My normal choice for PCB design is Autodesk Eagle, the freeware version I use at home is a great tool but limited by number of layers and board size. More info in the different versions of eagle can be found here. When starting Board A Week I said one of the things I wanted to try was to use other design tools on of the other design tools I wanted to really give some time to is KiCAD. 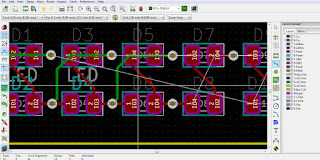 KiCAD is an integrated design suit with schematic editor, layout editor and 3D viewer, I have wanted to give KiCAD a try for many years but previous attempts have been unsuccessful. The unfortunate true when you have worked with a certain piece of software for years its becomes quiet difficult to learn a new way of doing things, and consequent have returned to eagle where I'm familiar. I started of by you throwing down a few parts into the schematic editor and trying to understand how the schematic editor relates to the layout editor using the classic 16 x 2 Character display and an ATMega32u4 MCU. I was thinking along the lines of making some kind of industrial looking watch. I got to a point that I realised this board would be far too complex to complete before the week was up, especially as I was still getting used to how the KiCAD operates. I have left my first design as I left it in the GitHUB Repo I don't believe i'm deleting failed attempts as they help me to learn from my mistakes. So in the end I restarted the board and idea to something useful and simpler a board with Charlieplexed LEDs. Charlieplexing is a method of multiplexing LEDs by using there diode properties (only allowing current to flow in one direction. This little board could be good for testing IO speed on different devices. KiCAD has a very particular workflow that must be adhered to when going between working with the schematic and working with the board design. The routing tools are much the same airwires are draw between connected pads and you have to connect them with wires. In KiCAD the airwires are always up to date as well, in eagle unfortunately you have to keep hitting the restnest button to get an up-to date render of the airwires which can get annoying when trying to layout the parts in a convenient way. The silk and artwork import tools are amazing they import as a library item making them easy to move around. The Gerber export was really straight forward and had valid Gerbers at the click of a button. Then wrapped them up in a zip file and put them into the Eurocircuts board viewer. Perfect!!! All in all really happy with using KiCAD its powerful and precise and i think there is a lot more to learn with it. Next weeks project involves making a custom part so some new skills to look at with the software. I've just started with KiCAD too. Have you updated to Version 5? Much better! Still exploring a lot of the features and as yet haven't created a custom part footprint yet. Good luck in your en devours in KiCAD as well.